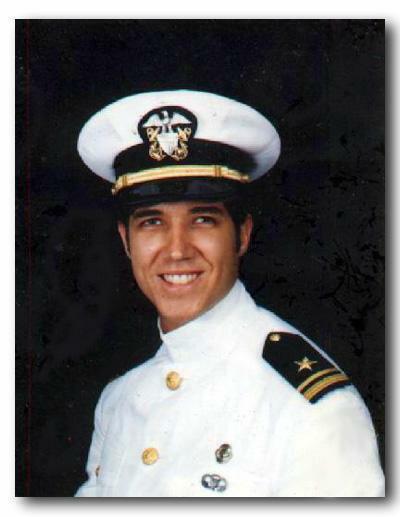 Pre-submarine service portrait as a junior grade lieutenant (LTJG). I wore the Airborne wings and the Scuba pin, but was missing submariner's dolphins, the most important thing in a submarine officer's career. At this point, nothing else mattered. Within a month of this picture, in November 1982, I would report aboard the Cold War hunter/killer fast attack nuclear submarine Hammerhead as the communications officer, where I would be expected to qualify as engineering officer of the watch (chief atom splitting officer in the nuclear control room aft) and then as officer of the deck (the man in command of the submarine who is responsible to the captain for major big picture decisions, like shooting a torpedo). Those two tickets would earn the coveted dolphin pin, naming the officer "Qualified in Submarines." This was it, the show, the first string, the thing of high school dreams. The moment captured here is another brief but shining moment of success, with the Academy, MIT, Airborne, Scuba, Nuclear Power School, Nuclear Prototype and Submarine School safely behind me. Now all I had to do was walk down the gangway to the Hammerhead, go to sea and make the seas safe for democracy. In 1982 it seemed very likely that we would be going to war with the Soviet Union in a major sea battle. I had trained for this moment for the last six years, and when the balloon went up I would be there with my hand on the trigger. Many times I've wished I could have done a freeze frame on life at this moment and not have to go through what was waiting for me next. From the high of being a firstie to the low of being an underling at MIT, I'd finally climbed back into the saddle, but from here I stood on the threshold of perhaps the most depressing year in my life.